• Sensitive and accurate. 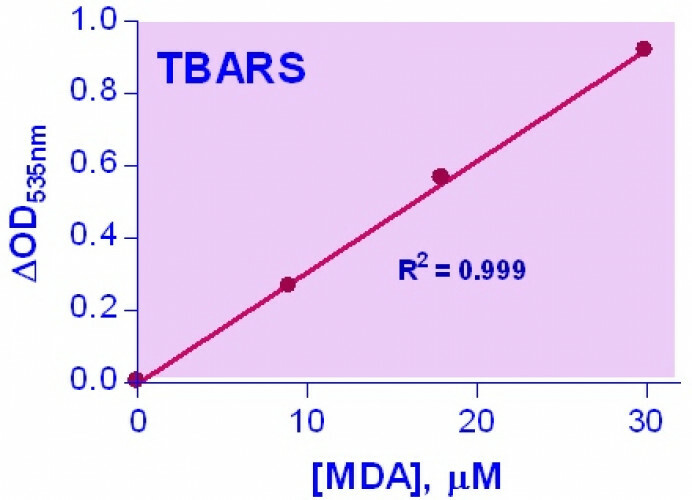 Linear detection range: colorimetric assay 1 -30 μM, fluorometric assay 0.1 - 1.5 μM MDA. Oxidative attack of essential cell components by reactive oxygen species has been associated with several human diseases, such as atherosclerosis, cardiovascular diseases, diabetes, liver disorders, and inflammatory rheumatic diseases. THIOBARBITURIC ACID REACTIVE SUBSTANCES (TBARS) are low-molecular-weight end products (mainly malondialdehyde, MDA) that are formed during the decomposition of lipid peroxidation products. Increased levels of TBARS have been demonstrated in these diseases. Simple, direct and accurate assays for TBARS find wide applications in research and drug discovery. BioAssay Systems’ TBARS assay is based on the reaction of TBARS with thiobarbituric acid (TBA) to form a pink colored product. The color intensity at 535nm or fluorescence intensity at (λex/em = 560nm/585nm) is directly proportional to TBARS concentration in the sample. Applications For quantitative determination of lipid peroxides (thiobarbituric acid reactive substances, TBARS) and evaluation of drug effects on lipid peroxidation. References Assay: TBARS in Turkey Liver (Pubmed). 2. Verweij, M et al (2011). Preoperative fasting protects mice against hepatic ischemia/reperfusion injury: mechanisms and effects on liver regeneration. Liver Transpl 17(6):695-704. Assay: TBARS in Mouse Liver (Pubmed). 3. Shanmugasundaram R, Selvaraj RK (2010). Dietary lutein and fish oil interact to alter atherosclerotic lesions in a Japanese quail model of atherosclerosis. J Anim Physiol Anim Nutr (Berl). [Epub ahead of print]. Assay: TBARS in Japanese Quail blood (Pubmed). 4. Davison, G (2011). Innate immune responses to a single session of sprint interval training. Appl Physiol Nutr Metab 36(3):395-404. Assay: TBARS in Human Blood, saliva (Pubmed). 5. Al-Amran, FG et al (2011). Amelioration of chronic cyclosporine A-induced nephrotoxicity by telmisartan in rats. African Journal of Pharmacy and Pharmacology 5(4):500-505. Assay: TBARS in Rat Renal tissue (Pubmed). 6. Hany, ML et al (2010). The Role of Oxidative Stress Markers and Nitric Oxide Levels in the Pathogenesis of Glaucoma. Australian Journal of Basic and Applied Sciences 4(8):3553-3558. 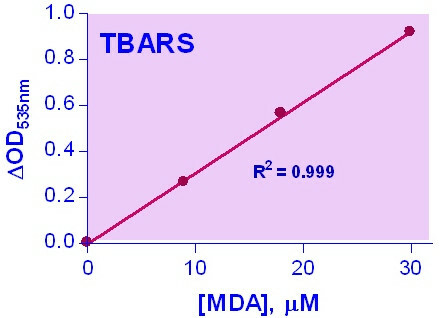 Assay: TBARS in Human Plasma (Pubmed). 7. Labib, HM et al (2010). The Role of Oxidative Stress Markers and Nitric Oxide Levels in the Pathogenesis of Glaucoma. Austr. J. Basic and Applied Sci 4(8): 3553-3558. Assay: TBARS in Human blood (Pubmed). 1. Shanmugasundaram R, Selvaraj RK (2011). Lutein supplementation alters inflammatory cytokine production and antioxidant status in F-line turkeys. Poult Sci 90(5):971-6. Assay: TBARS in Turkey Liver (Pubmed).